Dere Street Homes launch the final stage of their prestigious Longhirst Hall development, with the release of the eagerly-awaited apartments in what was originally part of the former Longhirst Hall Hotel. The 20 apartments range from one bedroom to three bedroom designs and include several duplex homes over two floors of the three storey building. “Each apartment is unique and has been thoughtfully designed to maximise space and create light filled interiors with a variety of high quality fixtures and fittings including granite worktops and integrated appliances as standard. The range of designs means that there is something to tempt a wide range of buyers, from professionals to those who are looking to downsize. The apartments offer everyone a unique opportunity to enjoy life in this peaceful corner of a private development. The wider Longhirst development offers a selection of beautiful and varied homes for all tastes and budgets ranging from the newly released one bedroom apartments, through three bedroom townhouses, one final four bedroom detached home right up to the magnificent conversions of the original Hall. The original Hall dates back to 1828 when the Lawson family commissioned John Dobson to build their country residence – the same architect who designed Newcastle’s famous Grey Street and some of the region’s most elegant buildings – and has been described as his finest classical design. Prices for those apartments currently released for sale range from £149,500 for a one bedroom design to £289,500 for a three bedroom apartment. Only three, three bedroom townhouses remain for sale, starting at £375,000, with the final four bedroom detached home being available at £470,000. The final part of the original Hall conversion, ‘The Orangerie’ has also now been released for sale and offers a unique, three storey, five bedroom home at £925,000. 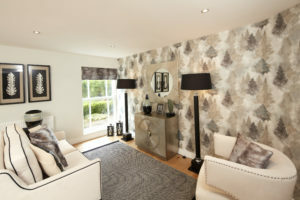 Full details of all the homes are available from Joan O’Connor, Development Sales Manager, Thursday to Monday 10.00am to 5.00pm on 01670 791825 or at www.derestreethomes.co.uk. Development Post Code: NE61 3NA.